Karen, a 32-year old pregnant woman, noticed that she is starting to feel abdominal pain. Upon arrival at the emergency room, the physician informed her that tests showed that she is not in labor. Past medical history showed that Karen has a history of cirrhosis. Karen also reported that she has clay-colored stools. After running a series of laboratory tests, Karen was diagnosed with choledocholithiasis. Diseases of the gallbladder and the biliary tract are common, and in most cases, painful conditions frequently require surgery and may be life-threatening. Cholelithiasis, stones or calculi (gallstones) in the gallbladder, results from changes in the bile components. 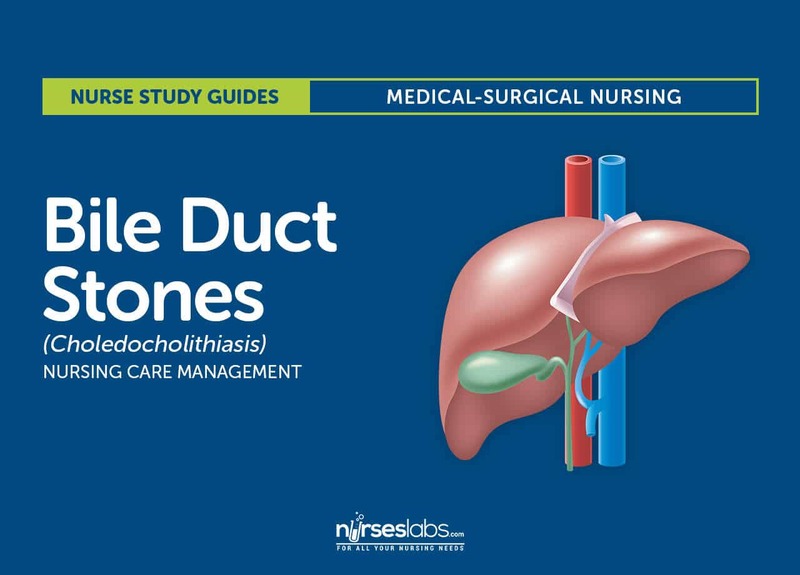 One out of ten patients with gallstones develops choledocholithiasis or gallstones in the common bile duct (sometimes called common duct stones). Gallstones are made of cholesterol, calcium bilirubinate, or a mixture of cholesterol and bilirubin pigment. The prognosis is usually good with treatment unless infection occurs, in which case the prognosis depends on its severity and response to antibiotics. Abnormal metabolism of cholesterol and bile salts plays an important role in gallstone formation. Too much cholesterol. Certain conditions such as age, obesity, and estrogen balance cause the liver to secrete bile that is abnormally high in cholesterol and lacking the proper concentration of bile salts. Inside the gallbladder. When the gallbladder concentrates this bile, inflammation may occur; excessive water and bile salts are reabsorbed, making the bile less soluble, and cholesterol, calcium, and bilirubin precipitates into gallstones. Cholecystokinin. Fat entering the duodenum causes the mucosa to secrete the hormone cholecystokinin, which stimulates the bladder to contract and empty. Irritation and inflammation. Biliary narrowing and swelling of the tissue around the stone can cause irritation and inflammation of the bile duct. Up the biliary tree. Inflammation can progress up the biliary tree and cause infection of any of the bile ducts. Choledocholithiasis is becoming a common phenomenon worldwide. Cholelithiasis is a common health problem, affecting 50% of white woman and 30% of white man. Out of every 10 patients with cholelithiasis, one develops choledocholithiasis. Gallstones are uncommon in children and young adults but become more prevalent with increasing age, affecting 30% to 40% of people by the age of 80 years. Pregnancy. A change in the hormonal activity during pregnancy increases the deposition of stones. Hormonal contraceptives. Hormonal contraceptives also alter the gallbladder activity, predisposing the patient to gallstones. Diabetes mellitus. Sluggishness of the gallbladder occurs because of the increased glucose levels in the blood. Cirrhosis of the liver. Cirrhosis of the liver leaves scars along the common bile duct which could trap gallstones with the duct. Choledocholithiasis may produce symptoms of a classic gallbladder attack. Acute abdominal pain. The attacks begin with acute abdominal pain in the right upper quadrant that may radiate to the back, between the shoulders, or to the front of the chest; the pain may be so severe that the patient seeks emergency medical care. Recurring fat intolerance. The patient is unable to digest fats properly because of the dysfunction in the gallbladder activity. Jaundice. Jaundice occurs if the stone is obstructing the common bile duct. Clay-colored stools. Stools become clay-colored because bile is already obstructed. Cholangitis. Cholangitis is an infection of the bile duct commonly associated with choledocholithiasis and may follow percutaneous transhepatic cholangiography or occlusion of endoscopic stents. Obstructive jaundice. Too much bilirubin absorbed into the blood may cause obstructive jaundice. Pancreatitis. The pancreas also becomes affected as the gallstones obstruct the common bile duct. Secondary biliary cirrhosis. Ultimately, the obstruction damages the liver, leading to cirrhosis. Abdominal computed tomography (CT) scan. Abdominal CT scan may detect stones in the gallbladder. Percutaneous transhepatic cholangiography. Done under fluoroscopic control, distinguishes between gallbladder and bile duct disease and cancer of the pancreatic head in patients with jaundice. Endoscopic retrograde cholangiopancreatography (ERCP). ERCP visualizes the biliary tree after insertion of the endoscope, down the esophagus to the duodenum, cannulation of the common bile duct and the pancreatic ducts, injection of the contrast medium. Hepatic biliary iminodiacetic acid (HIDA) scan. HIDA scan detects obstruction of the cystic duct. Magnetic resonance cholangiopancreatography. This scan can detect gallstones, choledocholithiasis, masses, biliary stricture, and dilation. Abdominal x-ray. If gallbladder disease is suspected, an abdominal x-ray may be obtained to exclude other causes of symptoms. Ultrasonography. Ultrasonography has replaced cholecystography as the diagnostic procedure of choice because it is rapid and accurate and can be used in patients with liver dysfunction and jaundice. Cholecystography. Oral cholangiography may be performed to detect gallstones and to assess the ability of the gallbladder to fill, concentrate its contents, contract and empty. Low-fat diet. Low-fat diet is prescribed to prevent attacks. Vitamin K administration. Vitamin K is given to manage the itching, jaundice, and bleeding tendencies due to vitamin K deficiency. NGT insertion. Insertion of NGT may be done during acute attacks. IV therapy. Intravenous therapy may be needed during acute attacks. Ursodeoxycholic acid. Ursodeoxycholic acid dissolves radiolucent stones for 6 to 12 months and provides an alternative for patients who are poor surgical risks or who refuse surgery. • Antibiotic therapy. Antibiotics are administered during acute attacks. Surgery, usually elective, is the treatment of choice for gallbladder and bile duct diseases. Laparoscopic cholecystectomy. Visualization of the gallbladder is done to remove the stones lodged in the common bile duct. Cholecystectomy with operative cholangiography. Removal of the stones in the common bile duct is one of the most frequently performed surgeries. ERCP with sphincterotomy. This procedure is the treatment of choice for choledocholithiasis with obstruction or cholangitis due to obstruction. The patient who is to undergo surgical treatment of gallstones is often admitted to the hospital or same day surgery unit on the morning of surgery. Assessment should focus on the respiratory status. History. The nurse notes a history of smoking, previous respiratory problems, shallow respirations, a persistent or ineffective cough, and the presence of adventitious breath sounds. Nutrition. Nutritional status is evaluated through a dietary history and a general examination performed at the time of preadmission testing. Laboratory results. The nurse reviews previously obtained laboratory results to obtain information about the patient’s status. Acute pain related to surgical incision. Impaired skin integrity related to altered biliary drainage after surgical intervention. Imbalanced nutrition, less than body requirements, related to inadequate bile secretion. Intact skin and improved biliary drainage. Patient care for gallbladder and bile duct diseases focuses on supportive care and close postoperative observation. Lung exercises. Before surgery, teach the patient to cough, deep breathe, expectorate, and perform leg exercises that are necessary after surgery. Patient education. Explain the procedures that will be performed before, during, and after surgery to help ease the patient’s anxiety and to help ensure his cooperation. Post surgery monitoring. After surgery, monitor the patient’s vital signs for signs of bleeding, infection, or atelectasis. Incision site care. Evaluate the incision site for bleeding; serosanguinous drainage is common for the first 24 to 48 hours if the patient has a wound drain. T-tube care. After a choledochostomy, a T-tube drain is placed in the duct and attached to a drainage bag, so make sure that the drainage tube has no kinks and check that the connection tube from the T-tube is well secured to the patient to prevent dislodgement. T-tube drainage monitoring. Measure and record T-tube drainage daily, which has a normal amount of 200 to 300 ml. I&O monitoring. Monitor the patient’s intake and output. Pain management. Evaluate the location, duration, and character of the pain, and administer adequate pain medications, especially before activities that increase pain. The nurse should promote home and community-based care. Medications. The nurse instructs the patient about medications that are prescribed and their actions. Symptoms to report. Inform the patient and the family about symptoms that should be reported to the physical, including jaundice, dark urine, pale-colored stools, pruritus, and signs of inflammation and infections, such as pain or fever. Drainage tube management. The nurse instructs the patient and the family of the proper care of the drainage tube and the importance of reporting promptly any changes in the amount and characteristics of the drainage. Follow up appointments. The nurse emphasizes the importance of keeping follow-up appointments and reminds the patient and the family of the importance of participating in health promotion activities and recommended health screening. Client’s description of response to pain.Acceptable level of pain. Respiratory rate, character of breath sounds, frequency, amount, and appearance pf secretions, and presence of cyanosis.Conditions that may interfere with oxygen supply. Characteristic of skin damageImpact of condition on personal image and lifestyle. Impact of condition on personal image and lifestyle.Caloric intake. Caloric intake.Individual cultural and religious restrictions, personal preferences. Individual cultural and religious restrictions, personal preferences.Plan of care. Teaching plan.Client’s responses to treatment, teaching, and actions performed. B: Cholelithiasis is the formation of gallstones in the gallbladder from the solid constituents of bile. A: Cholecystitis is the acute or chronic inflammation of the bladder. C: Choledocholithiasis is the formation gallstones in the common bile duct. D: Choledochotomy involves making an incision in the common duct, usually for removal of stones. Characterized by all of the above. D: All of the options above are risk factors for gallbladder disease. A, B, C: Multiparity, obesity, and women older than 40 years have greater risk factors for gallbladder disease. A: Amber-colored urine is seen in patients with urinary tract infection. B, C, D: Clay-colored feces, pruritus, and jaundice are clinical manifestations of common bile duct obstruction. D: Ultrasonography has replaced cholecystography as the diagnostic procedure of choice because it is rapid and accurate and can be used in patients with liver dysfunction and jaundice. A: If gallbladder disease is suspected, an abdominal x-ray may be obtained to exclude other causes of symptoms. B&C: Oral cholangiography may be performed to detect gallstones and to assess the ability of the gallbladder to fill, concentrate its contents, contract and empty. Pharmacologic therapy is frequently used to dissolve small gallstones. It takes about how many months of medication with UDCA for stones to dissolve? D: Six to 12 months of therapy are required in many patients to dissolve stones. A, B, C: 1 to 5 months of therapy is not enough to dissolve the stones. B: Cholelithiasis is the formation of gallstones in the gallbladder from the solid constituents of bile. A: Cholecystitis is the acute or chronic inflammation of the bladder. C: Choledocholithiasis is the formation gallstones in the common bile duct. D: Choledochotomy involves making an incision in the common duct, usually for removal of stones. C. Older than 40 years of age. D. Characterized by all of the above. 2. Answer: D. Characterized by all of the above. D: All of the options above are risk factors for gallbladder disease. A, B, C: Multiparity, obesity, and women older than 40 years have greater risk factors for gallbladder disease. 3. Answer: A. Amber-colored urine. A: Amber-colored urine is seen in patients with urinary tract infection. B, C, D: Clay-colored feces, pruritus, and jaundice are clinical manifestations of common bile duct obstruction. D: Ultrasonography has replaced cholecystography as the diagnostic procedure of choice because it is rapid and accurate and can be used in patients with liver dysfunction and jaundice. A: If gallbladder disease is suspected, an abdominal x-ray may be obtained to exclude other causes of symptoms. B&C: Oral cholangiography may be performed to detect gallstones and to assess the ability of the gallbladder to fill, concentrate its contents, contract and empty. 5. Pharmacologic therapy is frequently used to dissolve small gallstones. It takes about how many months of medication with UDCA for stones to dissolve? A. 1 to 2 months. B. 3 to 5 months. C. 6 to 8 months. D. 6 to 12 months. 5. Answer: D. 6 to 12 months. D: Six to 12 months of therapy are required in many patients to dissolve stones. A, B, C: 1 to 5 months of therapy is not enough to dissolve the stones.